Hear Robert Rose, Author & Chief Strategy Officer for The Content Advisory, talk to us about some of the biggest challenges he sees marketers facing today. 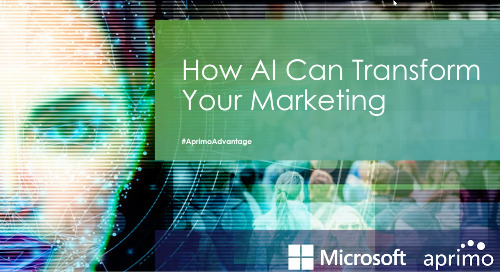 WEBINAR: Optimizing AI for Marketing: What’s the future and what’s just hype? Artificial Intelligence (AI) and machine learning have the potential to transform marketing by automating rote processes, simplifying digital asset management. The world of marketing has changed. With so many new digital channels, customer experiences are everywhere – creating an entirely new challenge for marketers. See how Aprimo can help! Content and the customer experience are inherently connected. Yet many organizations still struggle with content strategy, skills, process, ​and technology challenges that handicap business goals. Hear Robert Rose, Author & Chief Strategy Officer for The Content Advisory, talk to us about the balance of being consistent and interesting.